The San Francisco International Airport will name a terminal after Harvey Milk, the iconic LGBTQ rights advocate and the state’s first openly gay elected official. The plan includes the installation of artwork commemorating him. The idea of naming the airport itself after Milk was put forward by then-Supervisor David Campos five years ago. The proposal was met with opposition, the San Francisco Examiner notes, and an airport naming committee was formed to take up the issue. It has recommended naming the airport’s Terminal 1 after Milk. The Board of Supervisors Budget and Finance Committee will vote on the name change today. The legislation was introduced by Supervisor Hillary Ronen, and is co-sponsored by Supervisor Jeff Sheehy. If it is approved by the committee, the full board will vote on the legislation on April 3. The legislation requires the airport’s director to report to the board of supervisors and the mayor by December 1 “describing the steps the Airport has taken and plans to take” to name the terminal after Milk, as well as to properly publicize the move. “We will follow the direction of the Board of Supervisors legislation if passed, and incorporate this into the design and construction of Terminal 1, which opens in phases starting mid-2019,” airport spokesman Doug Yakel said. 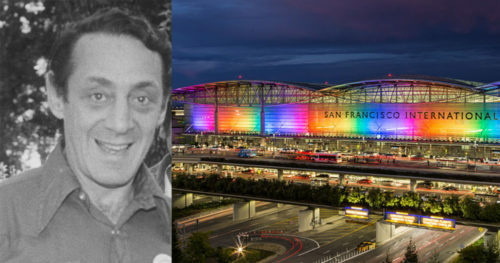 “In order to honor one of the nation’s great gay leaders, raise awareness of the history of the LGBT movement, and give hope to young LGBT people in cities everywhere, the Board of Supervisors finds it fitting that a terminal at the San Francisco International Airport be named in honor of Harvey Milk,” the legislation reads. “It’s a long time coming. It’s the gateway to San Francisco, and so recognizing Harvey and making that connection to our community is appropriate. Its beautiful,” Sheehy told the paper. Mayor Mark Farrell has said he supports renaming the terminal to honor Milk. Milk moved to San Francisco, from New York City where he was born and raised, in 1972. He was elected to the Board of Supervisors in 1977. He was gunned down at City Hall the following year, along with Mayor George Moscone, by former Supervisor Dan White. Since his death, Milk has gained even wider notoriety as a prominent leader for the rights of LGBTQ people.